The 9000A Automatic Cantilever Sliding Gate complies with BS/EN 12453. The gate portal is fitted with dual height photocells and 6 category 3 monitored live safety edges. The gate is controlled by a purpose made German Feig control panel, single phase supply, via an integrated frequency converter controlled output to a 3 phase motor. This can be configured very easily for all the standard program modes including no passage time outs & free exit and entry loops to name a few. As standard the control panel can accommodate pedestrian open signals, airlock systems and much more. The gate’s movement is controlled via a rack & pinion system monitored by an encoder. This allows for a precise and controlled operation that is robust and dependable. Our gates are delivered on a vehicle equipped with a crane, fully assembled, ready to bolt down continuing our “plug & play” ethos. This minimises disruption on site and ensures a smooth, quick and easy installation. We have developed the gate using aluminium construction with its obvious anti-corrosion properties/strength and longevity in mind. 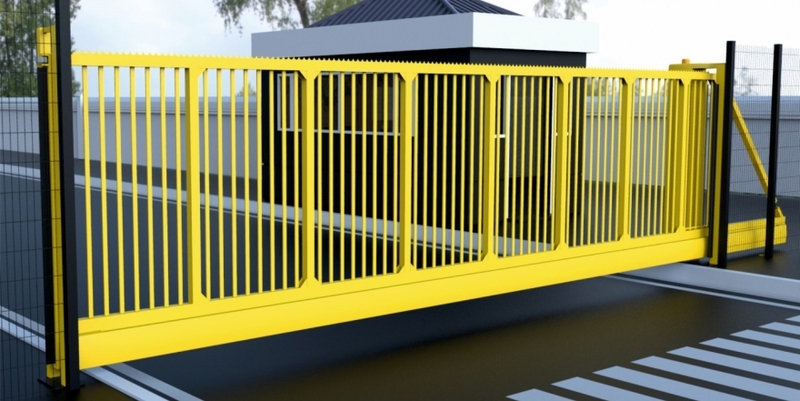 Trusted by many in the industry as the ultimate sliding gate it can be clad with a HUGE range of infills to suit the existing perimeter fence line. A VERY easy to use manual release mechanism which requires no tools in the event of power failure. Following the success of our larger PF9000 Sliding gates and due to market demand, we have developed the PF9100 designed for smaller openings. This makes the price point one of the best on the market, enabling you to be even more competitive. The 9100 Automatic Cantilever Sliding Gate complies with BS/EN 12453. The gate portal is fitted with dual height photocells and 6 category 3 monitored live safety edges. The gate is controlled by a purpose made German Feig control panel, single phase supply, via an integrated frequency converter controlled output to a 3 phase motor. The gate’s movement is controlled via a rack & pinion system monitored by an encoder. Our gates are delivered on a vehicle equipped with a crane, fully assembled, ready to bolt down continuing our “plug & play” ethos. This minimises disruption on site and ensures a smooth, quick and easy installation.